Fears that Nigerian Christians are facing ever-increasing bloodshed and violence are growing, human rights groups have warned, with the government failing to persecute and bring to justice the Islamic radical factions that killed over 4,000 Christians in 2015 alone. "As we speak, none of the perpetrators has been fished out and put on trial. That is to say the government is fully aiding and abetting the sundry ethno-religious cleansing and butcheries. It also partakes circumstantially and vicariously, if not directly," said Emeka Umeagbalasi, chairman for the International Society for Civil Liberties and the Rule of Law. 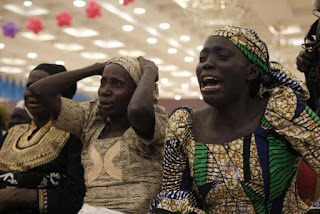 Christians, who make up close to half of the population in the country, have been targeted by major terror groups, such as Boko Haram and the Muslim Fulani herdsmen, News24 noted. Persecution watchdog groups such as Open Doors have warned that believers in the north of the county are especially in danger, with at least 4,028 reported Christian deaths in 2015, along with 198 attacks on churches. Boko Haram has been seeking to take down the Nigerian government and force Christians to flee the country, with Open Doors estimating that as many as 11,500 Christians have been killed since the insurgency started in 2009. Although President Muhammadu Buhari had promised to be tough on terrorism and help protect civilians, Umeagbalasi said the "unwillingness" and "inability" of the administration to protect Christians is "alarming" and "deafening." Umeagbalasi called on Christian leaders to "rise to the occasion" and stand up to the slaughter of Christians. "Advocacy steps must also be taken by Christian bodies and leaders to force the administration of Gen. Muhammadu Buhari to jettison the administration's obvious State Jihadism and Islamist policies and return Nigeria back to practicable constitutionalism, rule of law and secularity," he added. AllAfrica reported that the Primate of the Church of Nigeria (Anglican Communion), the Most Rev. Nicholas Okoh, has also called on Christians to defend their faith against persecution and violence. "It was so in the Bible time. If you read Revelation, you will find out that it is not new. What we charge them is to be diligent in prayer, monitor their environment and stand firm in the Lord," the cleric said. "Those in the volatile areas should pray and wait on the Lord, follow the examples of Christian leaders of old, some of them even died in order to defend their faith. They should not sell out but be strong and defend their faith." Former Congressman Frank Wolf, who is a distinguished senior fellow of the 21st Century Wilberforce Initiative, told The Christian Post last week that Nigerian Christians are looking to Western governments and churches for help, but at the present feel abandoned by them. "They feel abandoned by the West, and by the Church in the West. You are not hearing many in the West advocating (for them). They would expect that the faith community in the West, Europe, would be advocating, speaking out," Wolf told CP, noting that he visited Nigeria in February and spoke with local leaders. The 21st Century Wilberforce Initiative is calling for President Obama to establish a Special Envoy for Nigeria and the Lake Chad Region, who would address and engage with the wide range of complex realities facing refugees and internally displaced people facing terrorism and insecurity.